It’s been on the cards for a while. 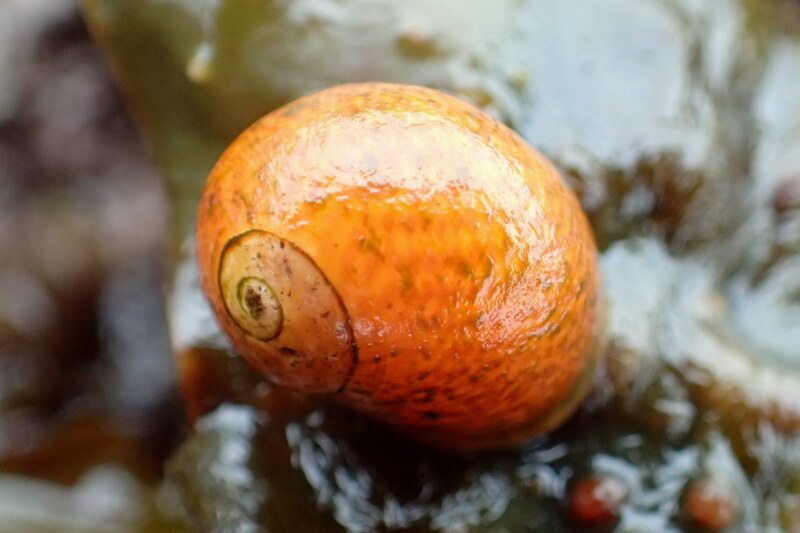 My old compact point and shoot camera was never great on the macro close-ups I like to take and it certainly wasn’t designed for the sand blasting, dunking in salt water and dropping on rocks that I’ve subjected it to. It’s amazing it lasted as long as it did, but the sand-choked lens finally gave up a couple of weeks ago. My old camera took a lot of persuading to focus on small things and often couldn’t cope. So, I’ve finally done it! I’ve bought a new camera. It’s a fairly basic compact, but it’s waterproof, shockproof, doesn’t have many places sand can get in and can actually focus on the little critters we all love. Off to a good start. 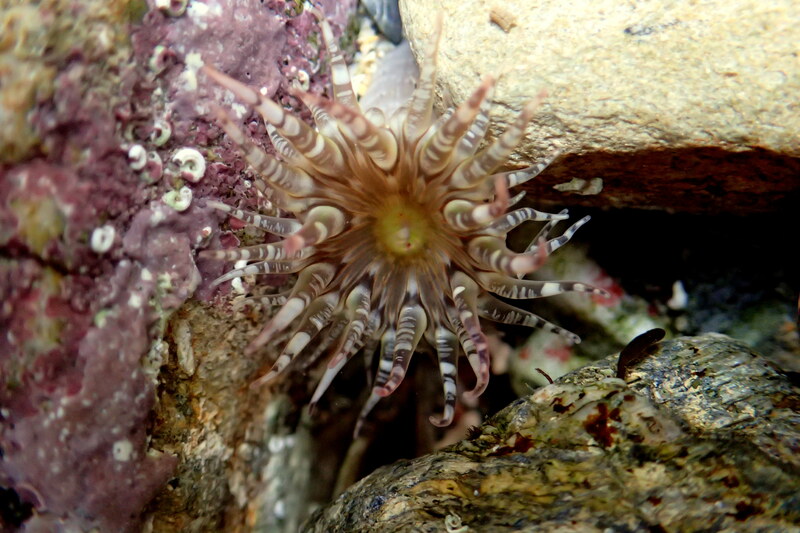 This gem anemone was easy to shoot with my new camera. When I started this blog I had one big worry. 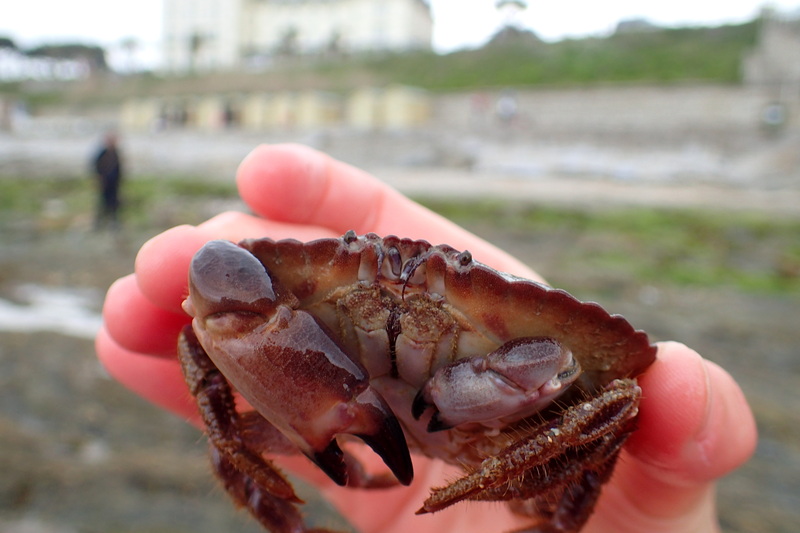 I am a writer and love to share the joys of rockpooling, but before I even started, I realised that wasn’t enough. A blog needs photos. My worry was on two counts. Most importantly, I didn’t see myself as a photographer. Frankly, I still don’t. I’m the sort of person who can spend a week’s holiday discovering amazing sights, being enthralled by the views and only discover my camera at the bottom of my bag on my return as I come to unpack. Even when I do remember, I just take quick snaps. My second problem is that I can neither justify nor afford the sort of equipment that would give me those fantastic shots you see in magazines. Even if I could fork out for the lenses, I wouldn’t know what to do with them and I’d need a hefty insurance package to cover the number of times I drop my equipment in sand and water. I once even managed to drop the camera on rocks and then fall on top of it in a slippery kelp gully. My ribs took several months to recover, but the camera miraculously survived. My new camera handles a classic crab shot nicely on the first attempt. Edible crab at Castle Beach, Falmouth. Since I set this site up last year, I’ve become quite an expert in cropping and adjusting my photos to turn them into something recognisable – and at times quite passable. With my new camera I am now able to take good resolution close-ups. My first foray to Castle Beach is a big success… I still need to work out all the settings, but I’m already capturing anemones, fish, prawns and more in more detail than I’ve ever managed before. 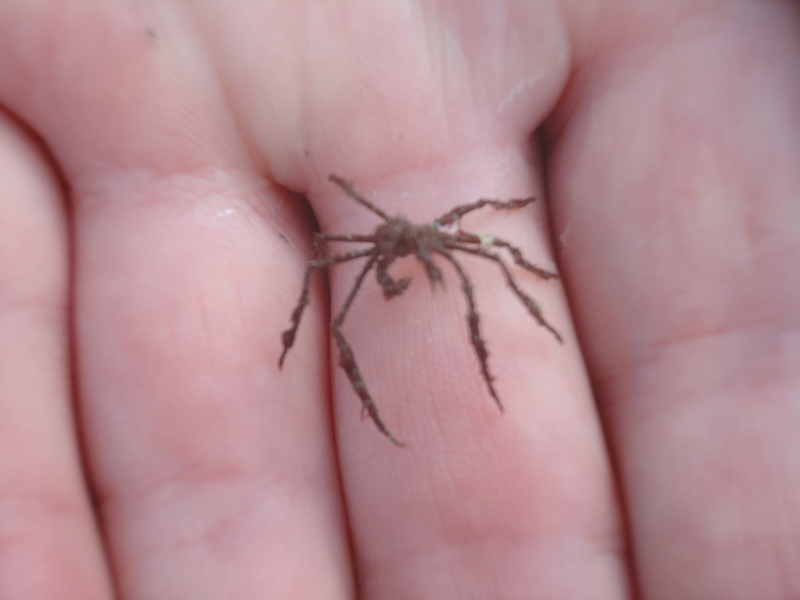 I’m hoping I’ll now be able to share photos of some of the tiny creatures that my old camera wouldn’t even attempt. I think I’m starting to enjoy photography. I’m off to the beach now, so watch this space! 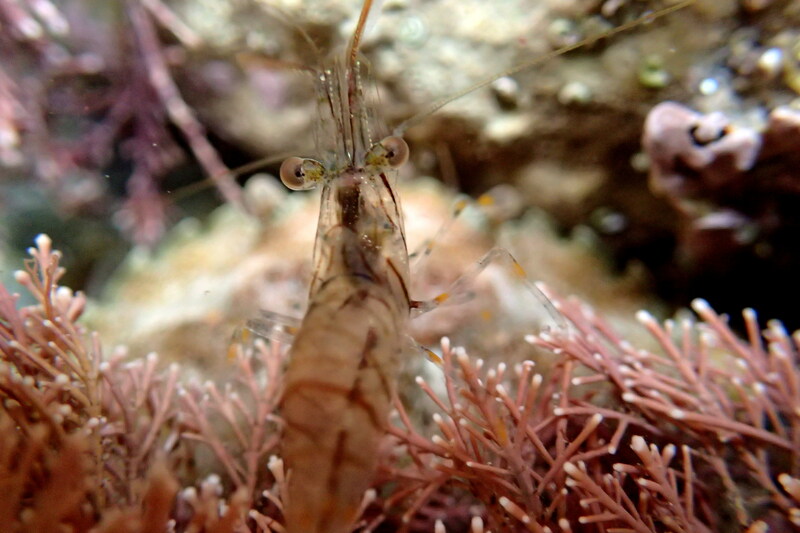 A common prawn swims over to say ‘hello’ to my new camera. Previous PostLife at the Mine Pool -Mawgan PorthNext PostA very British beach picnic. Wonderful photos, and wildlife! May I ask what camera you are using? I also don’t consider myself a photographer, for the most part I’m just trying to take photos so that the wildlife is recognisable and if it comes out looking particularly nice, that’s an added bonus! Thank you, that’s lovely feedback. It’s an Olympus TG-3 tough camera. As you can tell I’m very pleased with it. I’ve taken some photos of flowers, bees and lizards that have come out far better than anything my old camera could have managed. Lovely photos Heather, just the sort of camera I need for a trip to Kilminorth woods for flower close ups, and just in case I ever get to the Galápagos Islands! Hi Frances. Thanks for your comments, I’m so pleased you like the photos. My new camera is an Olympus TG-3 tough (I didn’t want to put the name in the post in case people thought I was on commission). It’s produced some great flower pics for me. If you do make it to Galapagos I’d love to see the photos.